When it comes to losing weight, there’s plenty of advice out there. Most of it is bad advice, talking about how one supplement or another can help you melt away the pounds. There are dozens of diet programs out there that swear up and down you’ll lose fifty pounds and three months, or exercise programs that promise you’ll put on twenty pounds of muscle in sixty days. Ultimately, the best way to lose weight is to get some exercise. Unfortunately, not everyone has access to a gym membership. Sometimes it’s a matter of money. Sometimes it’s a matter of time. Sometimes, it’s simply a matter of not wanting to go out and exercise in public. Whatever the case, a good solution for that is to set up a home gym. One of the best pieces of equipment for a home gym is a high quality treadmill. 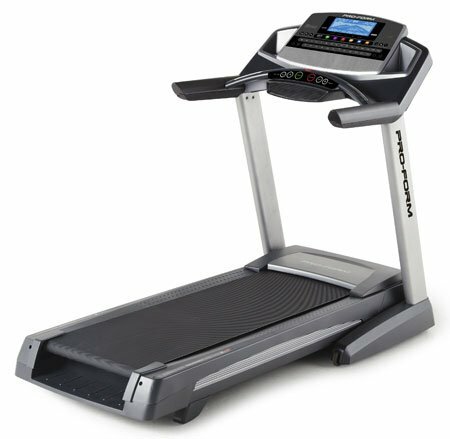 To that end, one of the higher end treadmills on the market right now is the 1080i treadmill by Proform Power. How good of a treadmill is it? What kind of features does it have, and how much will it cost you? The 1080i treadmill is a high end treadmill, there’s absolutely no question about that. It has so many features it can make your head spin. Starting with the basics, it offers speeds of up to 12 mph, and an incline of up to 15%. That’s more than many other treadmills out on the market today. This means it’s good enough to help you train for athletic competitions, if that’s your ultimate goal. Whatever your goal, whether it’s simple weight loss, cardio training, or anything else, the 1080i treadmill by Proform Power can help you meet that need. It’s got 32 different programs, each one designed to help you meet a specific workout need. Naturally, it does allow you to set your own speed and incline, but the apps can help you quick start your workout if you’re not certain what might be useful. Not only that, but it comes with dual grip EKG monitors. This means you hold on to two handles, and the treadmill checks your heart rate for you. This can be incredibly helpful when trying to get a good workout. It also comes equipped with all the smaller odds and ends that make a workout easier. It has an iFit program, which gives you access to music and video. It does require a membership, but the fact that it gives you access to such a thing is impressive. It can fold up for easy storage, and comes with a built in fan to help you stay cool while you exercise. It also has its own speakers, so that you can plug in your music device and listen to surround sound music. As if that wasn’t enough, it has rear rollers that are designed to keep as much wear and tear off the belt as possible. All in all, Proform Power’s 1080i treadmill is an amazing piece of technology. The only real downside is the price. Naturally, a treadmill that has so many features is going to cost quite a bit. It’s important to understand that it’s not overpriced for what you’re getting. However, that doesn’t mean it’s an easy price point to meet. If you’re worried about your budget, then you might want to get a lower cost treadmill with fewer features. That said, you’re not going to find a much better treadmill on the market than the 1080i treadmill by Proform Power. It really does have everything you need to lose weight and become an athletic machine. Copyright © 2019 Treadmill Reviews, All Rights Reserved.